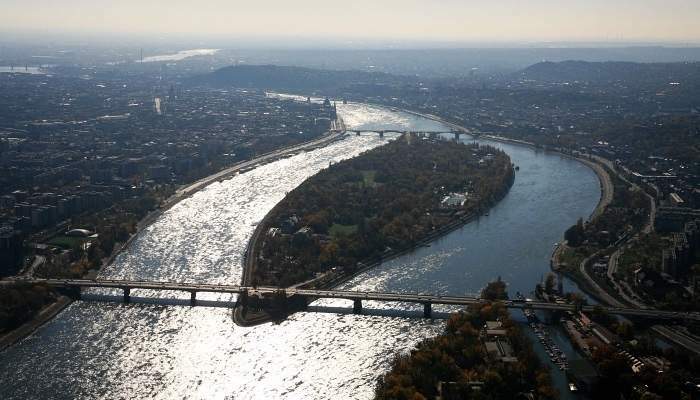 Surrounded by the Danube river, famous for its ancient trees and its beautiful gardens; Margaret Island is a historical place in the middle of the Hungarian capital of Budapest, full of beautiful spots that make it one of the most popular and most pleasant sightseeing destinations in the city. We advise you to come to the island with enough water and sunscreen during the summer as you might end up staying quite some time in the island’s gardens! Picnics and social gatherings are frequent among locals and travelers alike. It is indeed a great spot for relaxing and enjoying a sunny day! Referred to as Margitsziget in Hungarian, the island is named after Saint Margaret, Margit, the daughter of the 13th-century King Béla. She was one of the most loved princesses of Hungarian history, and as a tourist it is worth knowing about her life and personal story. Whether you want to discover the island’s gardens, the pools or the historical places, make sure to make the most of your time with our emission-free vehicles! We are Go Mobility, a company focused on green and innovative mobility solutions. We have 7 years of experience renting bikes, go karts and electric vehicles on Margaret Island, helping both tourists and locals alike to have fun in their time in this relaxing getaway from the city. Take our rentals for a ride to explore one of the most relaxing and pleasant parks in Europe, the unique fairy garden of Margaret Island! We offer rentals ranging from 30 minutes to a full day (available rental durations vary by vehicle type). Our full price list is available here. Make sure to discover the island’s history and main sights with us! We’ll be happy to drop you any hints and tips for you during your visit. Go Mobility. Your option to Go on Margaret Island. We are currently working on getting our FAQ ready. Meanwhile, if you have any questions please contact us directly. Go Mobility Limited Liability Company (seat: 1117 Budapest, Baranyai u. 12., registry number: 01-09-979252, tax number: 23814536-2-43, email: info@gomobility.eu, represented by: Bence Gosztonyi as managing director), hereinafter referred as the Lessor, is the owner of the properties indicated in the statement as the attachment of the general condition of contract (referred to as GCC). 1. Contracting parties agree that the Lessor lets out to lessee (hereinafter referred to as Lessee or User) and Lessee rents the properties together with its accessories and component parts indicated in the statement as the attachment of present GCC on date of signing the statement. 2. Lessor guarantees that property is technically suitable for proper use under the period of the lease, and there is no third party who is entitled to restrict the usage of it. 3. Lessee declares that he has received the property in fully working condition and was fully informed regarding the property’s technical attributes and handling by the Lessor. 4. Lessee is obliged to use, handle and protect the property and its equipment with due diligence. Lessee is responsible for any direct or indirect damages derived from the violation of the mentioned obligations. – to take it outside the Operating Zone defined by Lessor without the prior written permission of the Lessor. 6. Contracting parties agreed that Lessor is obliged to provide technical rescue if needed. In case of technical breakdown, the Lessee is not entitled to repair the property without the permission of the Lessor. 7. Parties agreed that Lessee is obliged to inform Lessor about any unexpected event and Lessee is also obliged to firstly inform the Lessor in case of damaging or theft of the property. In case of accident, Lessee must be bound to exercise due diligence, do everything possible to obtain the data of the persons involved in the accident (for example: registration number of the other vehicle, name and address of the driver, name and address of the witnesses, witnesses’ statements, photos). In case of accident, Lessee is not entitled to enter into any kind of agreement with the other persons involved and is not entitled to make any formal statement. 8. Lessor is not responsible for damages perpetrated by Lessee arising from technical breakdown or from lack of diligent use of the property. 9. In the case of damages arising from theft, Lessee is obliged to pay market value of the property for the Lessor. 10. Lessee is fully responsible for minor offences (irregular usage of the road, other misdemeanors, etc.) committed under the period of the lease agreement. 11. Parties agree that if Lessee does not return the rented vehicle by the end of the period of the lease and does not modify the period of the lease, the Lessor will be entitled to presume that a crime was committed regarding the property, and also entitled to report a criminal offense committed by Lessee to the police. Self-contained user: MonsteRoller: 16 years (14 years in case of live guided tour); Airwheel: 16 years; Gran Tour Gokart: 10 years; Bicycle: 12 years; Tandem bicycle: 12 years. Passenger accompanied by an adult (over 18 years old): MonsteRoller: 10 years; Gran Tour Gokart (equipped with seat belt): 3 years; Tandem bicycle: 12 years. Minors are only allowed to use the properties under supervision of adults, with the adults assuming full responsibility. By signing the statement, Lessee acknowledges that the age of the accompanied users complies with the above-mentioned age limitations. 13. User is required to pay a security deposit for the lease period which must be paid in cash. The amount of the deposit is calculated per vehicle and varies for vehicles. MonsteRoller: EUR 100 / HUF 30 000; Gran Tour Go Kart, Tandem, Bicycle: EUR 20 / HUF 5000; Moreover, it is necessary to put into deposit a valid photo ID document (such as national ID card, driving license or copy of passport) for the period of the lease. The personal data of the ID will be managed confidentially and at the end of the period of the lease and the returning of the property, the security deposit and the photo ID will be handed back for the Lessee if the property is in proper technical condition. If the technical conditions of the property are unsuitable after the lease period ends, the amount of the security will be withheld and used to return the property to its original technical condition. It is necessary to provide Lessor with a valid e-mail address for the commencement of the lease. Lessor is entitled to use the e-mail address one time in order to inquire about the quality of the service. After that, the data will be deleted in both electronic and written forms. 14. User acknowledges that they can only move on the route indicated by the guide if the lease includes a guide. 15. User acknowledges that they have been informed by the Lessor regarding the current regulation in the 1st and 5th districts of Budapest, where it is forbidden to use bicycles and electric vehicles (MonsteRoller, Airwheel, etc.) in the designated pedestrian zones (it is permitted to push the vehicle). 16. Under the period of the lease, User is obliged to inform the Lessor by phone or in any written form regarding any technical problems (eg. depleted battery), and Lessor must provide a replacement vehicle or change the battery on the spot within 30 minutes if the technical problem occurs within the Operating Zone. 17. This contract was prepared in two languages: English and Hungarian. In case of any disputes, the Hungarian version prevails. 18. Failure of the Lessor to exercise any rights granted in this GCC or by law shall not constitute a waiver of such rights. 19. No invalidity of certain provisions or gaps in regulation shall serve to invalidate the entirety of this GCC. Such invalid or missing provisions shall be replaced with one that best suits the meaning and purpose of the invalid or missing provision or the other provisions of the GCC. The Parties are entitled to validly send their written statements connected with this GCC to the seat of the Parties designated in the statement until they are informed in writing of a change in the address of the other Party. Mail returned as “receipt rejected”, “not collected”, “moved” or “address unknown” shall be regarded as delivered on the 5th (fifth) business day following mailing. Questions not regulated in this GCC shall be governed by the applicable laws of Hungary. Margaret Island is a place full of history, stories and particular spots that make up for a pleasant and relaxing time. It is famous for its ancient trees, well-preserved grass and coordinated flower work, as well as being surrounded by the Danube River. If you are looking for a relatively quiet and secluded place after a long day in the city, Margaret Island (Margitsziget in Hungarian) is definitely your spot. It’s quite romantic too! It’s common to see lovers enjoying each others’ company, marking their initials in trees with encircling hearts. When weather allows it, make sure to make a stop at the famous 1,000 square meters Musical Fountain with its water dances and spraying water in synchronized motion with musical accompaniment. Pumped and equipped with 154 fountain nozzles and 227 lamps and a variety of lights that invite you for a unique musical and visual experience each day between 11am and 9pm. If you have the chance, make sure to arrive after sunset! 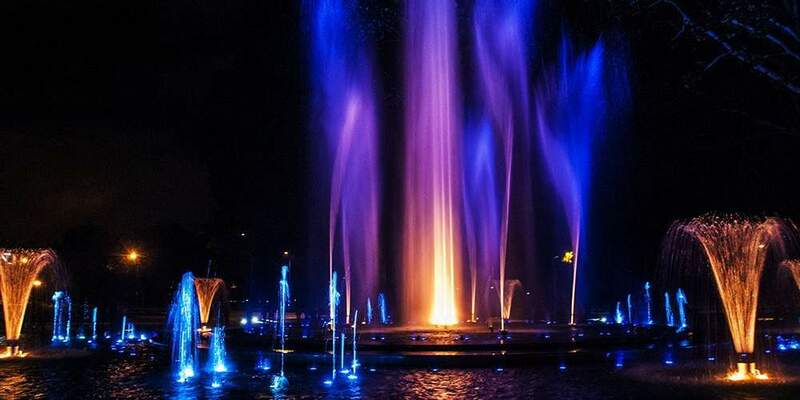 At 9pm, this magical fountain splashes with LED light colors that come alive as they are projected on a stunning water curtain. The Fountain is one of the island’s main sightseeing spots that are still open for free to the public to enjoy. With an extensive setlist of various styles of music, it invites tourists and locals alike to enjoy an enchanting experience. Wether you like the musical classics or modern songs, there is a place for everybody! The island has always been a famous hotspot during the day, but lately it has enjoyed a particular attraction also after sunset, as people enjoy to share a drink with friends and discover the well-illuminated paths and walkways. You can see events such as yoga or meditation classes being held among the trees. Sportive enthusiasts throwing balls through the grass. Children running around with their families. Runners enjoying both sides of the river in the paved running track. The island is an ideal place for picnics too! Wether you want to discover the island’s gardens, the pools or the historical places, make sure to make the most of your time with our emission-free vehicles! We are Go Mobility, a company focused on green and innovative mobility solutions. We have 7 years of experience renting bikes, go karts and electric vehicles on Margaret Island, helping both tourists and locals alike to have fun in their time in this relaxing getaway from the city. Take our rentals for a ride to explore one of the most relaxing and pleasant parks in Europe, the 95-hectare unique garden of Margaret Island! Make sure to discover the island’s history and main sights with us! We’ll be happy to give your some hints and tips to help you make the most of your visit.